Use the swivel mounting bracket to mount, swivel and tilt your 5-inch Garmin GPSMAP 521, 551 or 556 (among many other models, see compatibility list below) marine chartplotter to get the best viewing angle. Use the swivel mounting bracket to mount, swivel and tilt your 5-inch Garmin GPSMAP 521, 526, 530, 551, 556 marine chartplotter to get the best viewing angle. If you'd like to add Garmin marine BlueCharts to your Garmin GPSMAP 521, 551 or 556 device you can do just that by buying and loading Garmin BlueCharts. The charts come preloaded on microSD card together with a SD card adaptor. Simply insert the SD card into your Garmin GPSMAP 521, 551 or 556 and you are ready to take to sea with the latest nautical Garmin charts. What is the GPSMAP 521/551/556 swivel bracket compatible with? Question: I have a garmin gpsmap 525s on my boat. It is mounted using the swivel bracket but the plastic base that the swivel bracket fixes onto is broken. Ideally I don't need to buy a complete replacement swivel bracket but just this plastic base. Is this part available please? 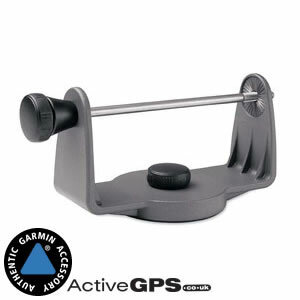 Answer: We purchase from Garmin UK and sell the complete Garmin GPSMAP 525 Swivel Mounting Bracket. We are unable to break down and sell parts off the mount. Do you have a question about the Garmin GPSMAP 521/551/556 swivel bracket? Submit your question via our contact page. Alternatively if you have a question about the marine swivel mounting bracket our contact page is the place to go to ask us a question.